ST. GEORGE — Dixie State University music department faculty and administrators gathered in the Eccles Concert Hall Monday afternoon to receive a special gift from Zions Bank: A new Model D Concert Grand Steinway piano, worth $162,000. 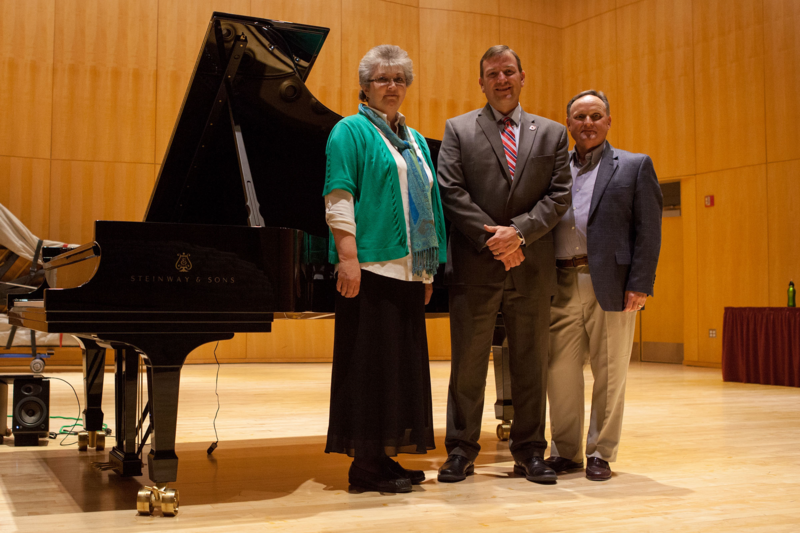 This donation is an important step for Dixie State’s music department as it works toward becoming an All-Steinway School. Jeffrey Jarvis, dean of the School of Visual and Performing Arts, thanked Zions Bank CEO and President Scott Anderson, who, he says, has been a strong supporter of the arts. Upon the piano’s arrival in the concert hall, faculty took turns stepping on stage to play expressive pieces and experience the sound of the new instrument. Nancy Allred, an associate piano professor, was the first to tickle the brand new ivories. While there is more work to do to attain All-Steinway status, DSU Music Department Chair Glenn Webb says Zions Bank’s donation is an invaluable contribution to the university. Jarvis says the piano will not only benefit piano majors but also all music majors and concert attendees. For more information, visit Dixie State University’s music department by going online here.